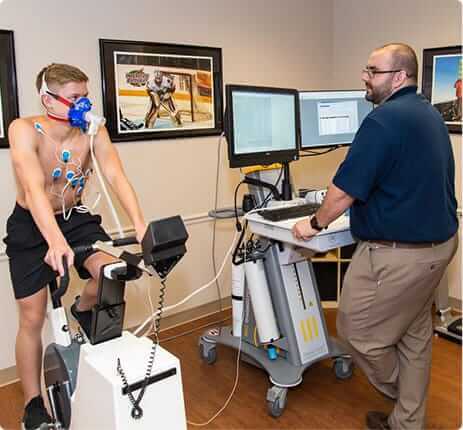 Chicago Pulmonary Specialists’ Sports Physiology Center of Chicago is a state-of-the-art exercise physiology lab dedicated to the comprehensive evaluation of the elite teen athlete. In fact, there is no other facility in the Chicagoland area that can provide a similar level of expert evaluation specifically for the teen athlete. The Sports Physiology Center of Chicago is unique in its adolescent-specific testing and evaluation protocols, age-appropriate equipment, and highly specialized staff. All aspects of the program are conducted under the close supervision of a medical doctor who has more than 20 years of experience in adolescent sports performance. The Center offers a wide range of sports-related and exercise testing services for the elite teen athlete. For more information about any of these testing services, call us at Chicago Pulmonary Specialists at (847) 998-3434 or request an appointment using our convenient online form.